We’re just over a week away from this year’s Updike Prize award ceremony, and we’re excited to welcome our featured speaker, Nina Stössinger, to Providence. If you want to get a head start and read a short article by Nina, try this one. Or maybe check out this interview with her and then follow her on Twitter. But whatever you do, be sure to join us on Monday, October 23rd, at the RISD Metcalf Auditorium and hear from Nina in person! 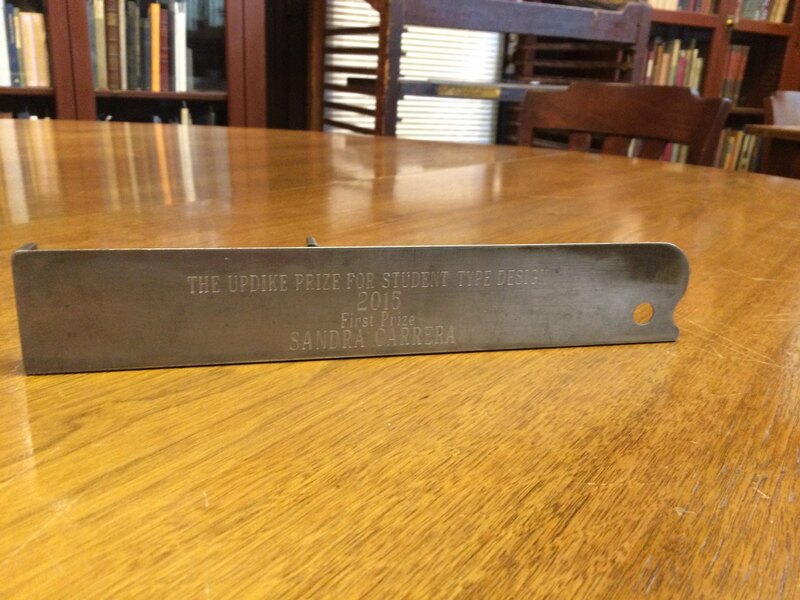 It’s a pleasure to announce that Sandra Carrera is the first ever winner of the Updike Prize for Student Type Design! The specimens will be on display, with items from the Updike Collection that influenced the type design, until March 19th. Kudos to all four finalists who did a great job! If you’re a student interested in type design, don’t forget that the 2016 competition starts now! Stop in to work with the collection or just learn more about it and the rules for the prize. And if you want to be notified about next year’s Updike Prize ceremony, stay tuned to this blog, or send us your email address to be added to our mailing list.